Helen works roughly one weekend in seven. In the summer the kids no longer have lessons on the weekends. This year, the Helen worked a weekend before our summer vacation so I was able to make a long weekend get away adventure. I drove through Lillooet once before, driving from Kamloops back to Vancouver and I remember it as a small town in the dry interior. I wanted to spend more time in the town and the area around to see what was there, a few hours from Vancouver. The kids and I left early Saturday morning and started driving up toward Whistler. The kids can only tolerate so much time without physical activity so my first stop was Shannon falls. We got to the parking lot and there were no parking spots. We continued along the highways a few hundred meters and stopped at the Sea to Sky Gondola. We parked in the hiking lot (still had space) and the first things the kids spotted was the playground. The quite enjoyed the whimsical little village. We then walked to Shannon falls and the kids took in the view. We drove up to Whistler and got a "to go" lunch for the car and then continued North to Pemberton, Mount Currie and then the drive over the pass to Lillooet. We passed the parking lot at Joffre lakes - both the main and the overflow lots were full and people parked on the side of the highway for up to a km away. We hoped to park on the way back. My hope was to get to Lillooet before a small bakery there closed. We arrived by 3pm and were disappointed to find it hadn't opened that day - operations issues. Hot from a long car ride, we went to Seton lake for a swim. Seton lake is cold. It's a deep lake and the swimming area is close to the inflow from an alpine river. It was a warm day (coming up on 30) so the cool lake was nice, but it's cold enough that the kids couldn't stay in for a long period of time. We had dinner at the best reviewed restaurant in town (Greek restaurant, that serves pizza and chicken strips with fries). The don't have a kids menu, but the kids have figured out to look around at what the other kids are eating and ask for the same. They got their favorite. After dinner we went for a walk to the old suspension bridge, just North of town. There is an Osprey family on one of the towers and they seem quite patient with people walking underneath. I was hoping to see some bats flying out at dusk but no such luck today. We went home and went to bed. The two kids fit in a single Queen sized bed, but it was a bit of struggle to get them to go to sleep. It did eventually work out. The next morning started with a walk at the fish spawning grounds at Sekw'el'was First Nation. The Seton river has a large section carved out as a bypass to the dam and as fish habitat to replace the habitat damaged by feedways. The place was empty (wrong season) but it was still good to get the kids out of the car for a walk around before we went for our day of exploring. I hit gold with a butterfly. Western Tiger Swallowtails are pretty common in Vancouver, but they never stop moving. When they do (rarely) stop moving, it's to perch in a tree way off the ground. We were wandering by the car and a butterfly stops on a thistle and just stops. It was cool in the morning and I suspect the butterfly was having a drink. I couldn't believe my luck - I shot photos and brought the kids over to see. Soon enough, the swallowtail was on it's way. 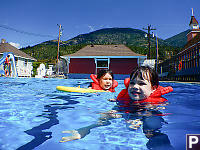 One of the goals of the day is to visit the outdoor swimming pool in Lytton. We stopped by here last year on our Spences Bridge roadtrip and we all really liked it. The pool is large with a large shallow end. 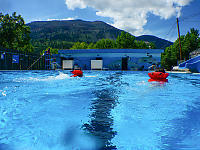 Mountains surround the pool and the air is hot so the cool water is extra refreshing. The amenities are basic, but everything you need. After our pool time, we got dressed and went for a car ride. I wanted to take the ferry across the fraser. The people in the visitor info centre told us they don't mind giving people a ride over and then back again, but they suggested we might want to drive to Stein Valley to see the rock art between our trips. Plan made! We drove over to the ferry and were the second (and final) car on the ferry. The crossing took about 5 minutes. We drove to the head of the Stein Valley and started walking. The Stein Valley was really dry, but is right next to a powerful, cold river. We walked over a bridge and the cool water from the river dropped the surrounding air temperature to comfortable. A few meters later we were at talking rock looking at the art. By the time we got back to the car, the kids were cooked. We drove back, over the fraser on the ferry and then back into Lytton for an ice cream. After eating the ice cream on the grass (my kids are too messy to eat a cone in the car), we packed back into the car and drove by to Lillooet. Both kids fell asleep in the car. If you look BC on a light pollution map, Vancouver and Victoria are basically a write off - too much light pollution. Lillooet is nearly light pollution free. I was thinking of taking some photos after the sun went down, but the moon came up shortly after and my camera can't really handle the contrast. I did get a photo of the view from our Air B&B just before the moon came up. The next morning we woke up to smoke. The forest fires burning near Cache Creek had blown over the mountain and the valley was now obscured. You could taste the smoke when you breathed. It was time to go home. The kids were playing in the field across from the house and stumbled upon (but not into) a prickly pear cactus. They really wanted to show me the spikes. The goal of the drive home was to be in Vancouver in time for dinner so we weren't really in a rush. Highway 99 between Lillooet and Pemberton is beautiful so we stopped a few times to take in the views. Our first stop was at the foot of Duffey Lake. It looks like an avalanche came down the previous winter and there was a large pile of snow covered in debris at the side of the road - the kids wanted a climb. On the way back to the car, we saw a patch of flowers. I started taking photos of the flower when another call pulled over. A passenger got out and started peeing on the flower about 4 meters to the left of me. I decided I wasn't going to spend a lot of time poking around. As we drove higher, the flowers started to crowd the side of the road. The ditch at the side of the road was filled with Bog Orchids and orange patches of Columbian Lily highlighted the slopes. I pulled over again and took a few quick pictures. Our next destination was Joffre Lakes. Helen and I camped at Joffre Lakes years ago. The parking lot was mostly full, but not nearly as crazy as the previous Saturday. There is a constant traffic of day trippers parking, walking and leaving so spots do come free. We walked the few minutes down the trail to see Lower Joffre lake. It was an overcast day so the glacier wasn't a gleaming white sheet against a blue sky, but you still appreciate the beauty of the area. On the walk back from the lake, we did a scavanger hunt looking for flowers. I was surprised how many different species the kids found in about 300 meters, but they are pretty good with their spotting eyes. Joffre Lakes was our last stop before we drove home. We stopped for pizza in Pemberton and were home well before dinner. Great road trip!